iPhone, iPad, Mac & Me: AM/FM Tuner iPhone App - WunderRadio! AM/FM Tuner iPhone App - WunderRadio! One of the criticisms of the iPhone is the lack of an AM/FM tuner. The WunderRadio app fulfills this needs very well. It is $5.99 on the App Store. While that may seem steep as prices on the App Store keep falling to foster competition, it is well worth every penny. WunderRadio takes the live internet stream of a radio station and broadcasts it on your iPhone. 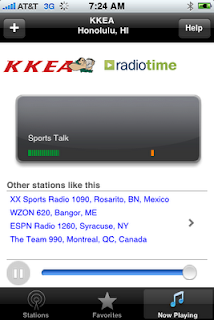 So, if your favorite radio station does not have an internet stream, you're out of luck with this app. Thankfully for me, just about every radio station I listen to (and I don't listen to much) is available. I also have AOL Radio, which is an adequate app to listen to genres of music. But, it has ZERO radio stations in Hawaii. I was also told that Tuner is a great radio app, but unfortunately it doesn't accept Windows Media Audio 9 streams and that covers just about every ClearChannel radio station. In Honolulu, there's mostly ClearChannel stations. With WunderRadio, I've had success with about 10 radio stations on Oahu and six radio stations on the neighbor islands. The list includes the #1 radio station KSSK, KKEA ESPN 1420, Hot 93.9, Star 101.9, 98.5 Island Reggae and KTUH. It also supports NWS Weather radio and scanners from ScanAmerica.us (although none of these are available in Hawaii). Apple Rating: 5 out of 5. Strongly recommended.